Her research is concerned with the concept of cosmopolitanism in literature as she seeks to challenge the definition of national literature through her main focus which is translation, both in the sense of a change of languages, and of a transaction and transmission between two cultures. She aims to rethink cross-Channel cultural dynamics between French and English literature in the 18th- 19th centuries in order to propose the first comparative, cohesive study of cosmopolitanism in literature, and to recover the transnational, transcultural networks of influence in literature. 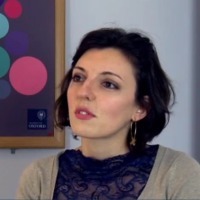 While holding a lectureship at Université de Lorraine, she is an associate junior research fellow (http://www.torch.ox.ac.uk/céline-sabiron) at Oxford University (Wolfson College; https://www.wolfson.ox.ac.uk/celine-sabiron).She is part of the AHRC-funded ‘Prismatic Jane Eyre‘ project headed by Prof. Matthew Reynolds (Oxford University) and Dr. Sowon Park (University of California, Santa Barbara). This collaborative experiment looks closely at Bronte’s novel as it is translated into multiple languages, understanding this process as transformation and growth rather than as loss. Together with two Masters students (Léa Koves and Vincent Thiery), she is responsable for the study of the French translations of Charlotte Brontë’s canonical novel. She is the SERA’s vice secretary and webmaster (Société d’Études du Romantisme Anglais), and she is a jury member (2015-2019) for the Agrégation Interne competitive examination formerly presided by Bertrand Richet (up to 2018) and currently led by Valérie Lacor (from 2019). She is a book reviewer for BARS’s Bulletin and Review (British Association for Romantic Studies), The Review of English Studies, Cahiers victoriens et édouardiens, SELVA (Society for the Study of Travel Writing in English), French Sudies, and The Wenshan Review. She also works for an Oxford-based translation company called Interlinguae. She aims at making her research accessible to a wider audience. For example she was commissioned to write an article on the borders of madness in Scott’s The Bride of Lammermoor for the Opéra National de Paris (“publications lyriques”) which scheduled a representation of Lucia di Lammermoor in the autumn 2016. Textualité et Traduction/ Textuality and Translation. Ed. Catherine Chauvin et Céline Sabiron. Coll. “Book Practices and Textual Itineraries”. Nancy: Presses Universitaires de Nancy/ Lorraine, Printemps 2019. Inconstances romantiques: visions et révisions. Ed. Antonella Braida-Laplace, Sophie Laniel-Musitelli et Céline Sabiron. Coll. “Regards croisés sur le monde anglophone”. Nancy: Presses Universitaires de Nancy/ Lorraine, Autumn 2019. “Decentering Commemorations: Literary, Cultural, Historical, and Political Celebrations across and beyond the British Isles”. Ed. Antonella Braida-Laplace, Jeremy Tranmer and Céline Sabiron. The European Journal of English Studies (EJES) 24 (2020). Evelina: On the Threshold/ Sur le Seuil, Collection “Intercalaires”, Paris: Presses Universitaires de Nanterre, 2015. (http://presses.u-paris10.fr/?p=2336). “Pichot and Scott’s Parrot: A Fabulous Tale of Parroting and Pirating” . Studies in Scottish Literature. Special issue on “Reworking Walter Scott” to be published by the University of South Carolina in Spring 2019 (volume 44, issue 2). “Walter Scott’s Portable Borderland: The Example of Anne of Geierstein (1829)”. Borders and Spaces in the English-Speaking World, RANAM, 52 (2019). “Robert Burns’s ‘Tam O’Shanter’”. Companion to Literary Romanticism: Essays. Ed. Andrew Maunder. New York: Facts on File, 2009. Daniel Grader, ed., The Life of Sir Walter Scott by John Macrone, intr. Gillian Hugues, Edinburgh: EUP, 2013, 156 pages. In The BARS Review 47 (2016). Martha C. Nussbaum and Alison L. Lacroix, ed., Subversion and Sympathy: Gender, Law, and the British Novel, Oxford: OUP, 2013, 313 pages. In The BARS Review 48 (2016). Judith Johnston, Victorian Women and the Economies of Travel, Translation and Culture 1830-1870, (Burlington: Ashgate, 2013) in Cahiers victoriens et édouardiens. 80 Autumn 2014. Invitation to talk on ‘Scott-land ou la fabrication de l’Écosse par Walter Scott’ at the CORPUS (Conflits, représentations et dialogues dans l’univers anglo-saxon) seminar series on ‘Les Lieux revisités’ at the Université de Picardie-Jules Verne (Amiens) on February, 4th 2019 (17h-18h30). Invitation to talk on ‘Translating the Border in Walter Scott’s Anne of Geierstein‘ at the SEARCH (Savoirs dans l’espace anglophone : représentations, culture, histoire) seminar series at the Université de Strasbourg on January, 25th 2019 (10h-11h). Invitation to talk at “les mercredis de la traduction” at the Université Paris Ouest-Nanterre on Wednesday 13 Dec. 2017. Title of the paper: “Performing Translatorship: Embedded Metatextual Discourses in Amédée Pichot’s work”. Invitation to talk about Scott and the Stuart Family at a one-day symposium on the 300th anniversary of the end of the regnant Stuarts. Conference supported by the British Academy and hosted by Corpus Christi College, Cambridge, Friday 29 August 2014. Invitation to talk at a seminar entitled “Romantic Realignments” of the University of Oxford on Nov, 14th 2013 to present my forthcoming book to be published in 2014. “Embedded Metatextual Discourses: Translating Walter Scott in the Context of Franco-Scottish Romantic Critical Dialogues”. Reworking Walter Scott Conference, 31st March-2nd April 2017, University of Dundee. “Translation as a common language through an analysis of Lewis Carroll’s 1871 ‘Jabberwocky’ poem”. Congrès de l’Association de Littérature Comparée à Vienne, Autriche, 21-27 juillet 2016. Atelier avec OCCT (Oxford) et le département de littérature comparée de Sorbonne-Paris 3. “L’engagement paradoxal scottien, ou comment réconcilier l’irréconciliable”. Congrès de la SAES sur l’Engagement à Toulon. 4-6 juin 2015. “Walter Scott and the Geographical Novel”, Literature and Geography Conference, Lyon 3 University, 12-13 March 2015. “Scott’s Rebellion Novels”, Colloque annuel de BSECS à St Hugh’s College, Oxford, 7 Jan. 2015. “Cross-Channel Literary Crossings and The Borders of Translatability”, Comparative Criticism and Translation Conference, St Anne’s College, Oxford University, 10-11 Sept. 2014. “Activating the Film Archive: the Scott Cinema Canon”, Tenth International Scott Conference, Aberdeen University, 8-12 July 2014. “Questioning the Translatability of Walter Scott’s Scottish Novels”, SAES conference, Caen University, 16-18 May 2014. “Translating Scottish Romanticism: Walter Scott in France”, BARS conference on “Romantic Imports and Exports”, Southampton University, 25-28 July 2013. “Romanticism Without Borders: Cross-Currents between English Romanticism, French Romanticism, and the British Fin de Siècle”, conference on “Romanticism at the Fin de Siècle”, Trinity College, Oxford University, 14-15 June 2013. “Translation as Transplantation: From Scott to Balzac through the Distorting Prism of Defauconpret”, “Reconfigurations”, Bristol and Exeter Universities, Bristol University, 19-20 Sept. 2012. “Walter Scott’s Secret Authorship, Or a Reversed Masquerade Played Across the Channel”, conference hosted by the Centre for Romantic Studies on Romanticism and Secrets, Bristol University, 2 May 2012. “Thackeray, Trollope, or the Scott Legacy: From Misconstructions to Literary Creations in Rebecca and Rowena and La Vendée”, Victorian Graduate Seminar, English Faculty, Oxford University, 30 Apr. 2012. “From Ivanhoe to Rebecca and Rowena: Walter Scott’s Shaping of Victorian Writing”, joint meeting of MRS (Midlands Romantic Seminar) and MIVSS (Midlands Interdisciplinary Victorian Studies) on the “Borders in the Long Nineteenth-Century”, Loughborough University, 13 Jan. 2012. “Border Crossings and Initiation Rituals in Walter Scott’s Waverley and Guy Mannering”, conference by BSECS (British Society for Eighteenth-Century Studies) on “Landscapes and Environments” at St Hugh’s College, Oxford University, 4-6 Jan. 2012. “Turning the World/Word Upside Down: Carnivalesque Inversions and Transgressive Writing in The Fair Maid of Perth and ‘The Highland Widow’”, Ninth Walter Scott International Conference on “Walter Scott: Sheriff and Outlaw”, University of Wyoming, Laramie, 5-9 July 2011. “Homecoming and Liminality in Walter Scott’s Guy Mannering”, French Society for Scottish Studies (SFÉÉc) on “exile and return: contexts and comparisons”, University of St Andrews, 12 Sept. 2009. “The Role of the Intertext and the Palimpsest in the Creation of a Mythical Scotland in Walter Scott’s Waverley and Rob Roy”, conference by the doctoral school of the Sorbonne University on “The Construction of Images: Persuasion, Rhetorics and the Creation of Myth”, Sorbonne University (Paris IV), 12 June 2009. “Romanticism and Topography in Walter Scott’s The Heart of Midlothian”, conference by BARS (British Association for Romantic Studies) on “Romanticism and Place”, University of Bristol, 24 Sept. 2008. “Mapping Borders: From the Corporeal to the Incorporeal in Walter Scott’s The Heart of Midlothian”, international conference on “The Novel and its Borders”, University of Aberdeen, 8-10 July 2008.